To provide quality, courteous customer service and promote the safety and the proper flow of traffic and turnover throughout the streets of downtown Macon. To protect the rights of the pedestrians and parking public who abide by local and state parking ordinances and laws. To assist in providing available parking to residents, visitors and businesses. To enforce the city and state parking ordinances and laws. As a representative of Macon-Bibb and Lanier Parking Solutions, ambassadors will perform their duties in a professional manner at all times and to the highest standards. WHY IS THERE A THREE-HOUR LIMIT AT THE METERS? PARK Macon-Bibb extended the time limit zones from 2 hours to 3 hours in an effort to better accommodate the needs of our stakeholders. The reason for time limit zones is to create turnover and additional parking spaces by moving long term parkers into the parking garages to ensure customers have a convenient place to park when parking for short term. WHERE CAN I PARK LONGER THAN THREE HOURS? If you need to park longer than 3 hours, we recommend parking in one of the parking garages downtown most of which are cheaper than parking at the meter. There is one PARK Macon-Bibb garage located at 440 Mulberry Street that charges $1.00 per hour Monday through Friday from 7:00 am – 7:00 pm. Please visit the “Pay My Parking Ticket” section of the website. HOW DO I CONTEST THIS PARKING TICKET? Please visit the “Appeal My Parking Ticket” section of the website. DO YOU OFFER THE ABILITY TO PAY WITH A SMARTPHONE APP? Yes! Please visit the “Park By Cell with Passport” section of the website. HOW CAN I GET A RECEIPT WHEN I PARK AT THE METER? 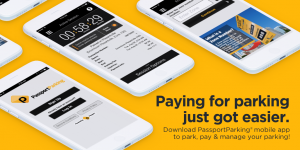 We recommend using the PassportParking app if you are needing a parking receipt when parking at the meter. I LIVE DOWNTOWN IN A PLACE THAT DOES NOT PROVIDE PARKING. WHERE CAN I PARK? Please visit the “Residential Parking Program” section of the website for several options. WHEN DO I NOT HAVE TO PAY TO PARK? All PARK Macon-Bibb on-street meters are free after 8:00 PM and all day on Sundays. The PARK Macon-Bibb garage at 440 Mulberry Garage Street is free on Saturdays and Sundays and any time after 7:00 PM from Monday through Friday. In addition, parking is free on these holidays (unless otherwise announced): New Year’s Day, Memorial Day, 4th of July, Labor Day, Thanksgiving Day, and Christmas Day.